I’m currently writing a Majora’s Mask AU in which Termina only exists because of Link. In my story, after Link “saves” Termina, it begins to disappear. The only two people who are even marginally aware of that anything is strange are Zelda and Ganondorf, who have been drawn into Termina by the strength of Link’s dream. Zelda is seeing it in a vision, and Ganondorf is experiencing it from where he’s imprisoned in the Sacred Realm. Neither of them realizes this until the end of the story, when they figure out that they have to wake up into the “real” world of Ocarina of Time, which is a much harsher reality than the one contained within Termina. At the moment Tumblr seems to be the main platform people are using to engage with fandom; and, unlike LiveJournal or even Twitter, Tumblr exhibits an extreme bias toward images. What this means in practice is that fan art gets a ton of love, while fanfic receives relatively little attention. People complain about this all the time, and I routinely tell fic writers I’m friendly with that they should stop trying to write for fandom. Instead, it might make more sense for them to file off the serial numbers of their work so that they can publish it as original fiction. This is easier said than done, of course, and in fact I declined to follow my own advice when I began outlining the plot and character details for this story. Two people trapped in a fading dreamworld is a fairly broad and open concept, and the characters obviously don’t have to be Zelda and Ganondorf. It would be fairly easy to change the names and smudge the identifying details and thus write a completely “original” story… but I don’t want to. I recently finished my third playthrough of Breath of the Wild, and instead of moving on to something different I decided to pick up Majora’s Mask, which I hadn’t played since the game was released on the Nintendo 3DS back in 2015. I love the dark and foreboding atmosphere of the game, and I’m fascinated by all the many ways that Termina is falling apart at its seams. I read Majora’s Mask as a deep dive into the trauma that Link experienced in Ocarina of Time, especially his guilt over the fact that, even with the ability to travel through time, he couldn’t save everyone. I’m fascinated by Majora’s Mask, and I want to spend more time in the world of the game. I also want to explore its themes from a different perspective. Specifically, what trauma did Zelda experience in Ocarina of Time? And what about Ganondorf? Who would these two characters be if they weren’t trapped in their respective roles? And what does it mean that they are trapped? What I’m trying to do with this fanfic is to read Majora’s Mask through a critical lens. I’m a big fan of analytic meta essays about the game and its story, but I want to do something a little more creative in the way I examine its themes. For example, Majora’s Mask strips away Link’s identity as the “Hero of Time” and places him into a new environment, but the core of his character remains – he’s still a hero. 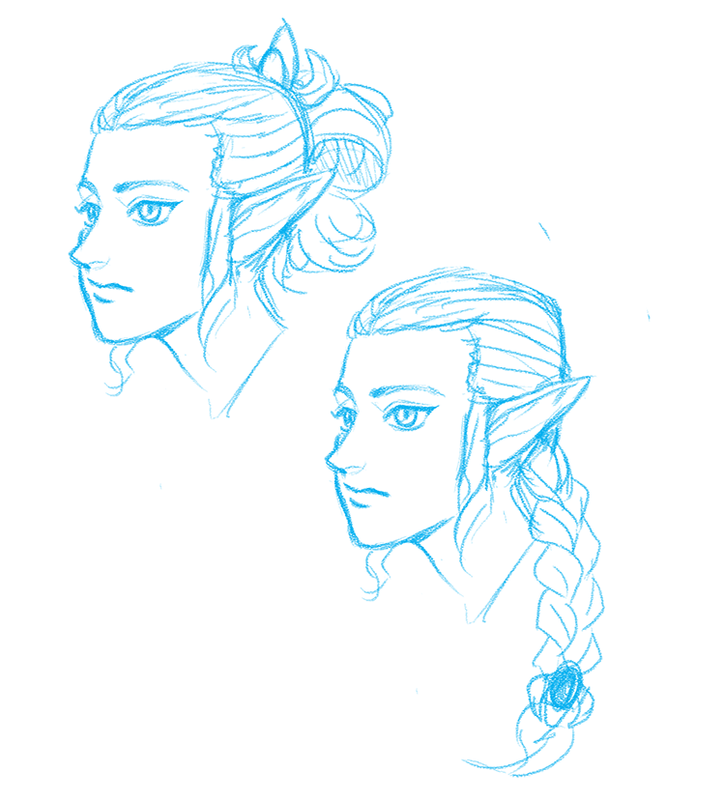 So what would it look like if Zelda’s identity as the “princess of Hyrule” were stripped away? Who would she be? 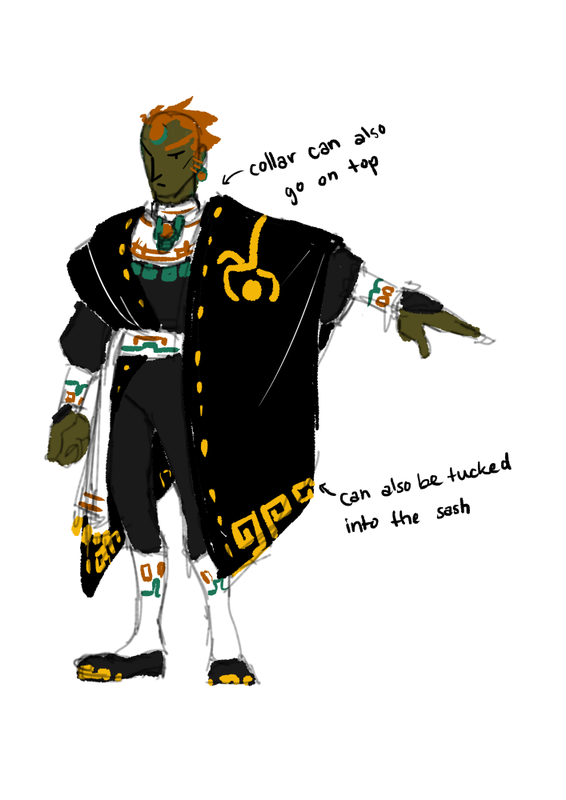 And who would Ganondorf be if he weren’t the “Demon King Ganon”? I want to play with these archetypes, but I’m also interested in the challenge of adding greater depth to seemingly one-note character tropes. One of the nice things about working in the discursive space of fandom is that there’s a pre-existing community of readers who might be interested in a story like this. There’s also a large community of artists, especially in the fandom of a well-established gaming franchise like Legend of Zelda. Even though I don’t have much artistic talent myself, I’m primarily a visual person, and I find it inspiring to collaborate with artists on illustrations. This generally works in the same way it does in the independent comic publishing business, namely, the writer commissions an artist. Although most of the actual labor of illustration is done by the artist, it’s the writer’s job to find someone whose style and interests would be a good fit for the project. In fandom, this is relatively easy, but it’s still very cool when sparks fly and magic happens. I’m very lucky to be able to work with Thali (@snoozeforever on Twitter / @ponthion on Tumblr) to create illustrations for this story, since I’ve been a fan of her art for years. 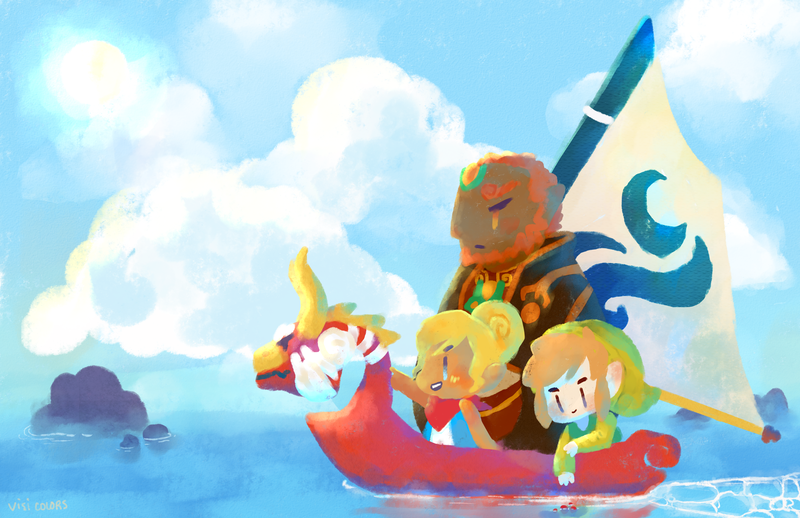 In fact, it’s her critical engagement with the Legend of Zelda games as expressed through her artwork that encouraged me to start engaging with the Zelda fandom on Tumblr. It’s a little embarrassing to commission an illustration for my own story, especially if it’s fanfiction. On the other hand, it’s an incredible experience to watch my ideas and characters come to life in visual art. The process of communicating with artists about design elements is also a lot of fun. It can sometimes be a challenge to try to express a complicated character concept in just one or two sentences so as not to overwhelm people with long emails full of extraneous details, but I am continually amazed by the brilliant interpretations created by the artists with whom I’ve had the honor of collaborating. In any case, Thali has created as created multiple incredible designs based on the character concepts I sent her, and you can see some of my favorites below! (1) Find a picture of a cute frog, and give yourself ten seconds to copy it. Do another copy in thirty seconds, and then another in a minute. Repeat the process with a second frog, and then draw it with your first frog. Now they’re frog friends! (2) Draw a piece of your favorite fruit. First draw it whole, and then draw it in slices. Now draw it as a topping on a cupcake or a parfait or a slice of pie. (3) Draw a leaf from your favorite tree, both rightside-up and upside-down. Now draw one of the seeds, berries, cones, or fruit from this tree. Now turn the leaf and the seed into a Korok! (4) Draw a speech bubble saying “You’re awesome,” and then draw your first anime boyfriend/girlfriend underneath that speech bubble. For an extra challenge, you can draw them in both the artist’s original style and in your own style. (5) Draw Gozilla with huge sparkling Steven Universe eyes, and then color your drawing using a palette randomly selected from a color palette generator (like this one). (6) Draw a video game system or control pad that brings back good memories from your childhood. Now color it with super shiny pastel shades! (7) Design a set of three to five simple stickers that you would love to have received as a child. Please consider: dinosaurs, knights, planets, mythological creatures, fairies, and mad scientists. (8) Draw the monster from your favorite horror movie blushing and being shy and adorable. Remember, we’ve all done crazy things to get sempai to notice us. (9) Buddhist hand gestures used to enhance meditative practice are called mudras. Run an image search and try to draw at least two left hands and two right hands in mudra positions. (10) Draw a piece of inorganic trash, which can be anything: a soda can, a shoe that’s falling apart, a worn-out tire, a plastic bottle, a discarded toy, an empty cereal box, and so on. Now draw fresh green plant shoots growing out of it, and add one or two flowers if you’d like. New life always emerges from the ruins of old mistakes!